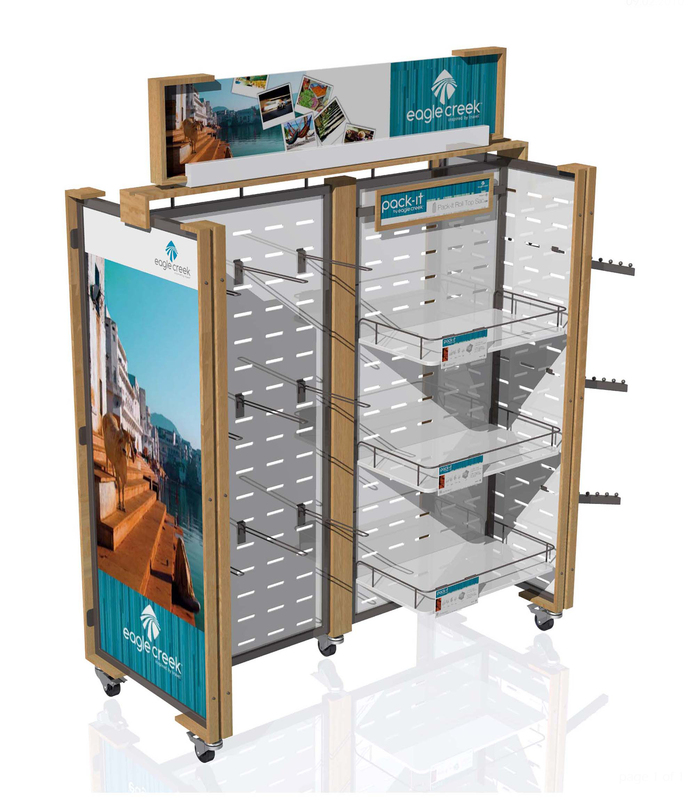 For many of our apparel and accessory customers, we are often tasked with the challenge of designing a complete family of retail fixtures that are complementary and capable of working in a broad range of retail environments. Apparel and accessory fixtures generally require a lot of flexibility because of the breadth of products that need to be merchandised. In addition, many brands want to be able to offer fixture programs to a diverse set of retailers- from mass market retailers to specialty retailers. Having a fixture program that has the versatility to work for large and small accounts while also being able to accommodate changing fashions and evolving product lines is an important asset for accessory brands who are looking to expand distribution and penetrate new accounts. RICH LTD. was invited by Eagle Creek to design a family of travel luggage and accessory fixtures for their line of products. We began by designing the 8-ft. wall fixture shown below. The wall fixture was constructed of solid wood and featured wood cabinets at the bottom with pull-out drawers. We designed removable sheet metal/wire shelves, incorporated adjustable metal crossbars for waterfall arms/faceouts and hooks, and included digitally printed PVC logo signs and lifestyle graphics. The second fixture we designed was a 4-ft. long mobile gondola constructed of metal slatgrids configured in an “H” shape. We framed the slatgrid with solid wood and added PVC panel signs as well as hanging header signs on both ends of the fixture. 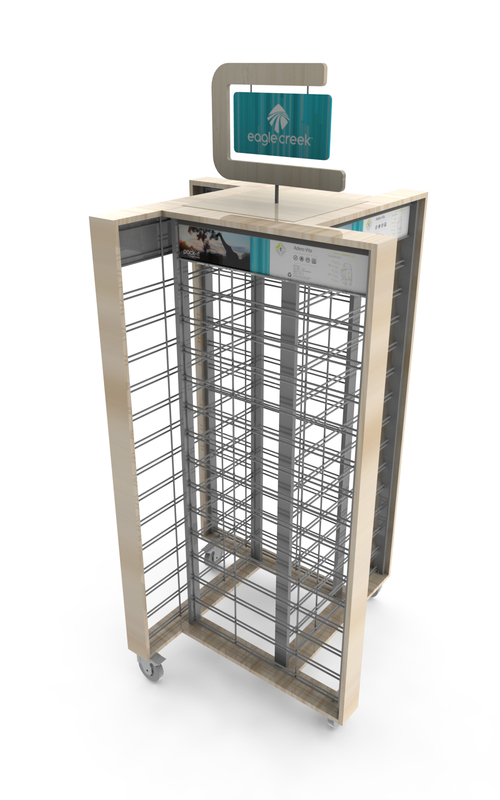 This unit was designed to be very flexible and versatile as well as appropriate in almost any retail environment. We also created a more upscale variation of the mobile gondola that was similar in shape and size, but rather than wire slatgrid, we used sheet metal panel inserts with laser cut slots on the two center panels and one end panel. We designed adjustable sheet metal shelves with wire fencing and shelf branding and also included OSHA hooks and waterfall arms to provide a cost effective hanging solution. 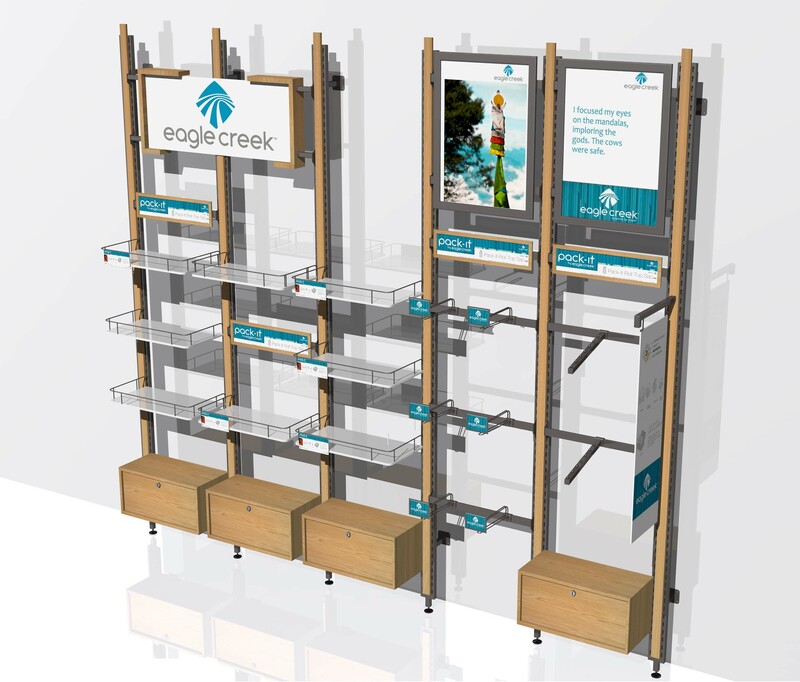 We designed a full size graphic on one of the ends of the fixture and added a header sign with a partial wood frame to emphasize the Eagle Creek brand. The fourth member of the Eagle Creek fixture family was a pinwheel floor display that utilized the same wire slatgrid panels with wood frames. 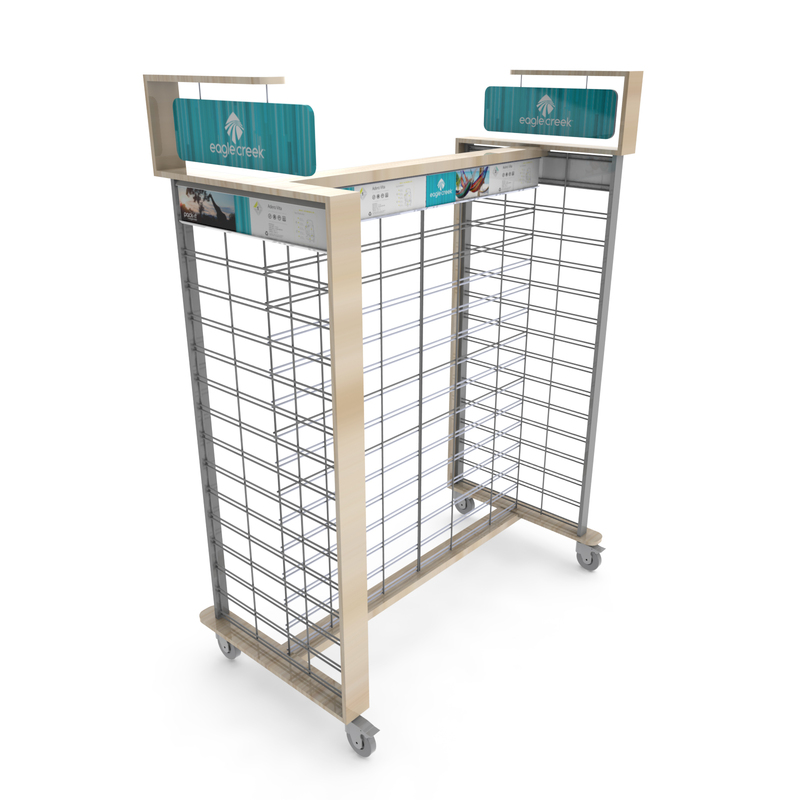 As with the slatgrid gondola we included castors to make the unit mobile and added PVC signs at the top of each slatgrid panel. We enclosed the top of the fixture with solid wood and designed a distinctive hanging sign to create a unique and upscale look. We also created a variation of the above pinwheel unit by adding a circular wood base on castors and revising the header sign to be 4-sided rather than two-sided. This fixture was really created just to provide another pinwheel design option for Eagle Creek. 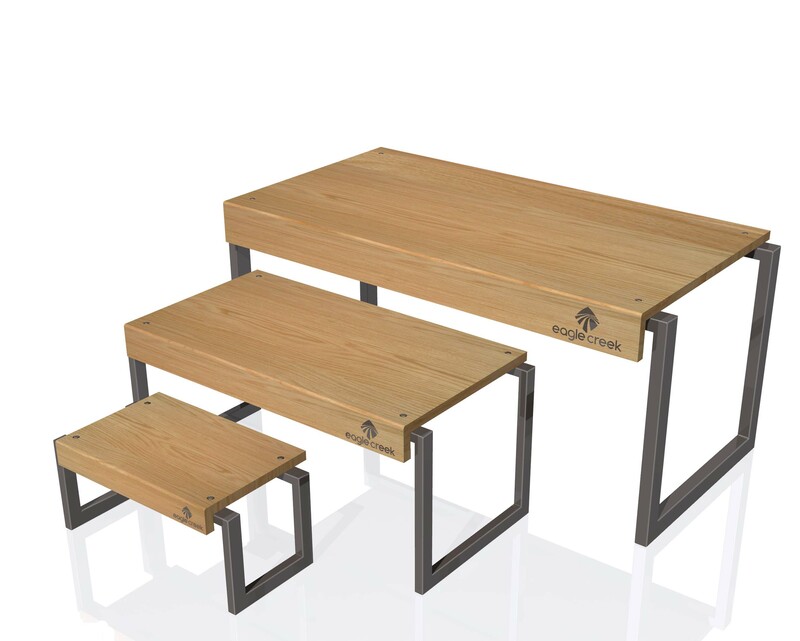 Finally, we designed a set of 3 nesting tables that were intended to be simple and elegant. The nesting tables were designed with a powder coated metal tube frame with solid wood tops that included a silk screened Eagle Creek logo. The family of Eagle Creek fixtures we designed provided a full range of fixture choices for retailers and helped to build the Eagle Creek brand.